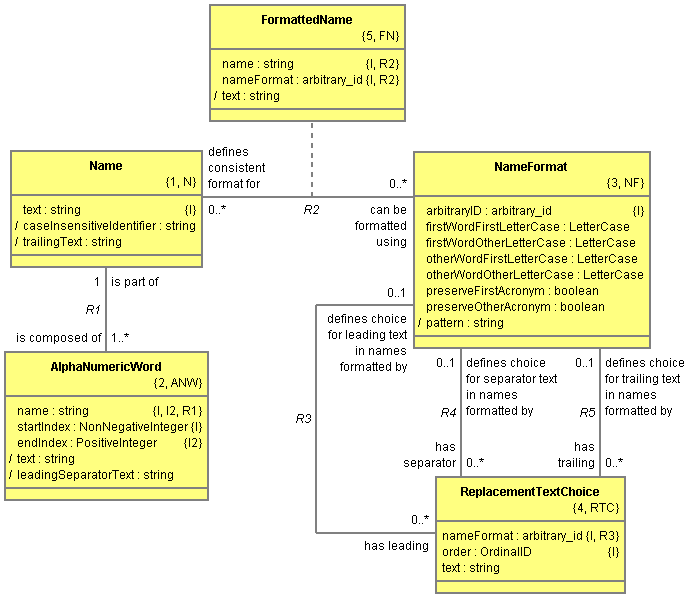 Names within OOA10's OOA of OOA are represented using a single attribute with a data type of Name. However, names are more complicated than they first appear. 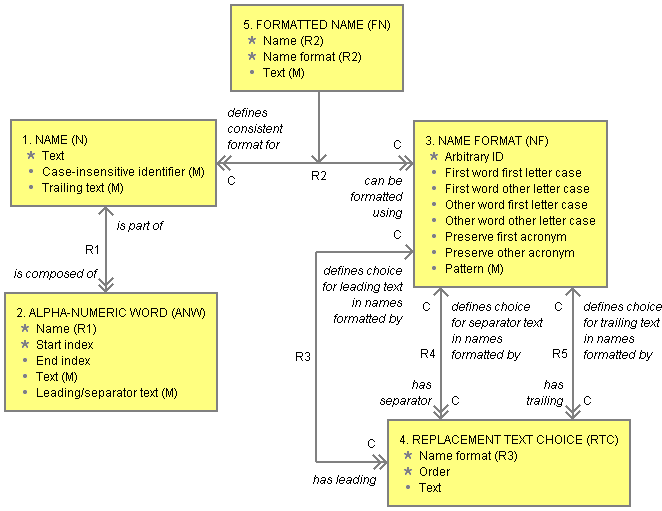 Names need to be formatted into numerous formats across various diagrams and generated work products. Letter case will often change during this formatting, as will the separator text before, between and after the words which compose each name. However, even though a name may have many formatted representations, there needs to be an underlying name for determining uniqueness within the context of what is being named. This underlying name needs to be case-insensitive and independent of particular separator text so that uniqueness is maintained in the many formatted representations of each name. A Naming service domain has been created to formalize names and name formats. Each name is decomposed into one or more alpha-numeric words to simplify formatting. Each word is either all letters or all digits. In the model above, alpha-numeric words contain start and end indexes for the word's text within the original text representation. This also allows us to determine any separating text that precedes the word. This appears to break the normal Shlaer-Mellor rule that attribute values are atomic. However, data values in OOA10 are write atomic but not necessarily read atomic.